LiveVault makes secure backup and restore a snap. If you like life to be simple, then you’ll love the ease of LiveVault’s online backup and restore service. I’m talking easy. No longer must you fuss with tape or lengthy turnaround times for backups or restores — LiveVault does it all for you. Initially, I spent about an hour on the phone with a LiveVault representative who walked me through every step of the service, ranging from setup to basic use and abuse. This little lesson seemed a bit unusual, but I was told that when a company signs up for the service, it would get this call. During the call, you provide LiveVault with the basics —who you are, what you want to back up (including servers) and who you want accessing these backups. LiveVault provides you with a transparent download agent and a login password. I created a desktop shortcut on an application server and was off to the races. Because the LiveVault service requires an always-on Internet connection (cable, DSL or T1/T3), security’s a concern. If I were a zillion-dollar company, the last thing I’d want is someone poking around my data. Fortunately, using the downloadable agent, you connect via a virtual private network. What’s more, data is encrypted with 192-bit security both over the pipe and on the tape stored in the Iron Mountain facility (which is where most backups are kept). I was assured that each “tape handler” goes through rigorous security checks, ensuring that not just anyone is near my data. When it comes to restores — such as a crashed server — LiveVault sends a link via e-mail to connect to your account, where you log in and download the backed-up data to the crashed server. If a RAID array fails, replace it with a new array, attach your server to the network and restore from another PC or server. Pretty awesome, huh? What’s more, if you need a CD or network-attached storage device from which to restore, LiveVault will ship it overnight (at your cost). Your data has to be current, but that’s a small price to pay. Of course, this is all assuming that the server running LiveVault is the one that fails. If it isn’t, log into the service as usual and hit the Restore tab for the latest backup for the machine in question. To see it in action, I created a text file on a network drive, ran a full backup on the entire drive (and specifically included the file) and restored it. It restored everything I backed up (including the test file) as expected. What’s more, LiveVault sent me an e-mail with the stats of the restore. 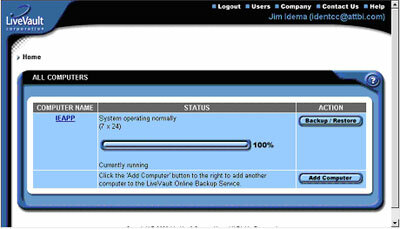 The LiveVault interface, like the service itself, is user-friendly. This is one of the better products I’ve seen, as it eliminates the need for expensive tape or drives. It’s fast, secure and worth every penny. It’s only a matter of time before all backups and restores go the way of an online service, and LiveVault shows why.